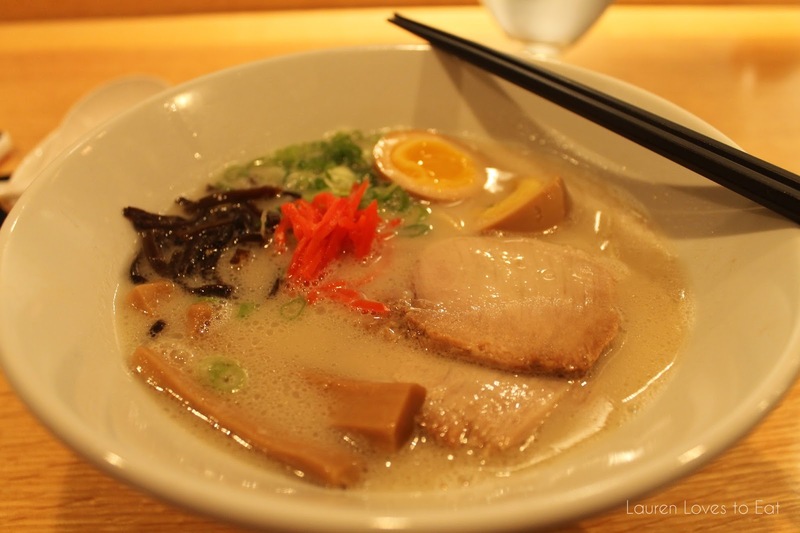 The first few times I visited Ippudo, I was not impressed. Then in the past 2 months, because of visitors in town, I happened to dine there three times. 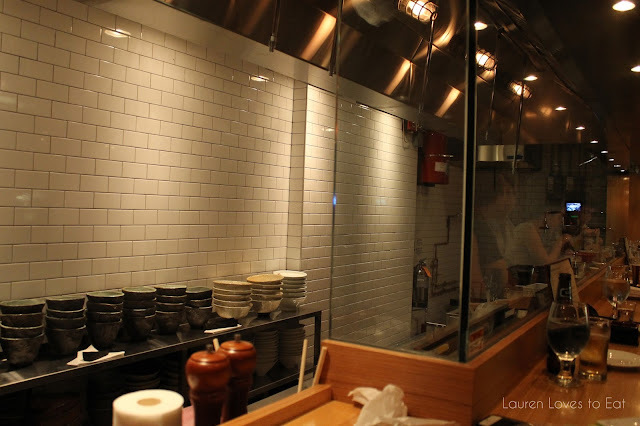 Once in the east village location, and twice in the new midtown west restaurant. I've since been converted to an ippudo fan. One of the best things about the westside location is that both times I got there at 6-6:15pm on weekdays, there was no wait for our party of 4, and most recently, our party of 2. By 7 something, the quote for waits is an hour and a half for parties of these sizes, so try to get there early if possible! 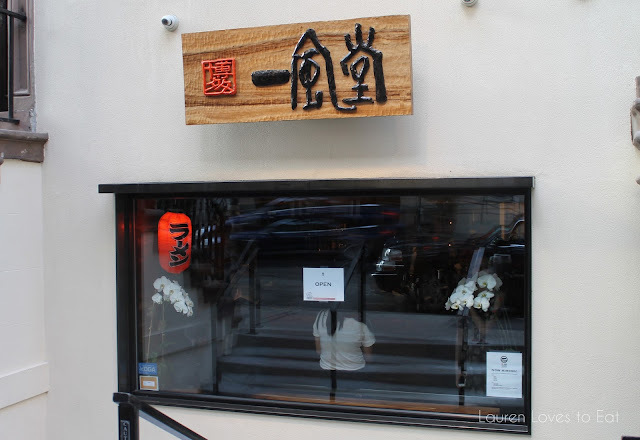 It's a welcome change to the line that forms outside of the east village Ippudo as early as 5pm on weeknights. There's no English sign outside the restaurant sandwiched between two residences, but this is what it looks like. On my most recent visit, we were seated upstairs. It's definitely more quiet, but a little boring as well. There are only 9 or 10 seats along this bar, and there is no chef stationed here for entertainment either. So we all faced the white walls. 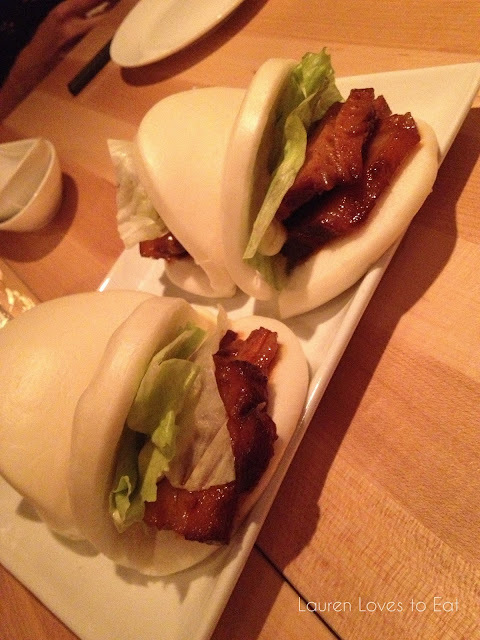 Pork Hirata Buns, $9: Two steamed buns with pork, lettuce, Ippudo's original spicy sauce and mayo. This is a MUST for me at Ippudo. Such soft and fluffy buns, the perfect amount of kick in the spicy sauce, and the most tender and tasty pork. Warning, almost half of each piece is fat, but I promise you it's worth it. Akamaru Modern, $15: Tonkotsu (pork) soup noodles with Ippudo's "umami dama" miso paste, pork chashu, cabbage, sesame kikurage mushrooms, scallions, garlic oil. Basically one of the tastiest bowls of ramen in life. 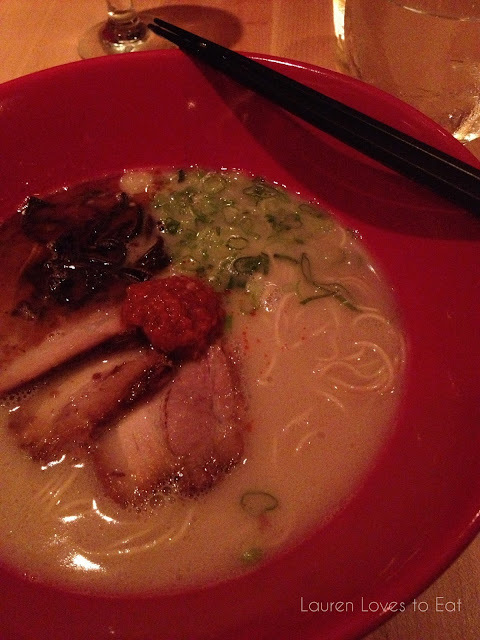 So much flavor, and the pork is nice and tender (although not as tender as Minca or Kambi ramen in east village). The noodles have the perfect chewiness, and the soup has a wonderful richness to it with an almost milky-like broth. Shiromaru Hakata Classic, $15: Tonkotsu pork broth, westide's signature dashi, pork loin chashu, sesame kikurage mushrooms, menma, red pickled ginger, and scallions. Soft Boiled Egg, $2. The broth in the Classic is definitely on the more underwhelming side; especially after memories of the Akamaru Modern still lingered in my mind. The ginger was so fresh and strong that it was also too overpowering in my opinion. Stick to the Akamaru Modern. haha dinner at Ippudo sometime? ?